The title of “Much Apu About Something,” about Apu’s nephew Jamshed (or Jay, as he prefers) turning the Kwik-E-Mart into a health food store, might reference a beloved episode about Apu’s dignity in the face of Springfield’s hairtrigger xenophobia, but it’s equally a referendum on the character of Apu Nahasapeemapetilon himself. So Ambudkhar’s casting as Jay (first seen as a child back in season four, wielding a shotgun and guarding the Kwik-E-Mart) suggested that Apu might be due for adjustment, or even retirement. (There was unfounded speculation that he was even going to be killed off.) As it turns out, things return to one in true Simpsons fashion by the end of the episode, as Jay’s refashioned, all-natural store, Quick & Fresh (“Who spells “quick” with a “Q?,” rants Apu) is destroyed, and a single salvaged scratch ticket allows Apu to put things back the way he wants them. It might seem a facile way to resolve Apu and Jay’s conflict, if not that episode writer Michael Price (creator of the recent F Is For Family) does some nimble work in showing Springfield’s essentially all-stereotype population is the only place Apu really belongs. That’s exactly what I’m talking to you about. You’re my uncle and I love you, but you’re a stereotype, man. Take a penny, leave a penny. I’m Indian, I do yoga. Why don’t you go back to the Temple of Doom, Dr. Jones! Apu, after angrily asserting he only worked on Temple Of Doom for three months and that you can only see part of his hand in the finished film (a funny turn), is taken aback, but, storming out, he can’t help but reinforce his nephew’s point, snapping, “This stereotype will no longer be a troublesome potato in your spicy vindaloo!” Which is when Luigi comes out of the kitchen of his Italian restaurant and complains that stereotypes are-a no-a good-a, etc. The term “equal-opportunity offender” is often the flapping flag signaling a dispiriting defense of boorish assholery or just plain comic laziness, but The Simpsons’ blanket irreverence toward cultural and religious affiliation has indeed been reliably uniform over the years. So much so that when the show has seemed to engage in unambiguous prejudices itself, (as in season thirteen’s Brazil-bashing “Blame It On Lisa,” for one) it’s been especially jarring. What Price is doing in “Much Apu About Something” isn’t so much excusing the show’s use of stereotypical characters as acknowledging that, while some stereotypical aspects of characters like Apu have grown outdated (and proven hurtful to some, including the episode’s guest star), they are part of a continuum of broad cultural satire. Again, I’m not Indian, and as a white, heterosexual male, I renounce any claim to truly understanding a lot of the ways unreflective prejudices (as the show maintains the creation of Apu was) are deeply painful to see and hear. 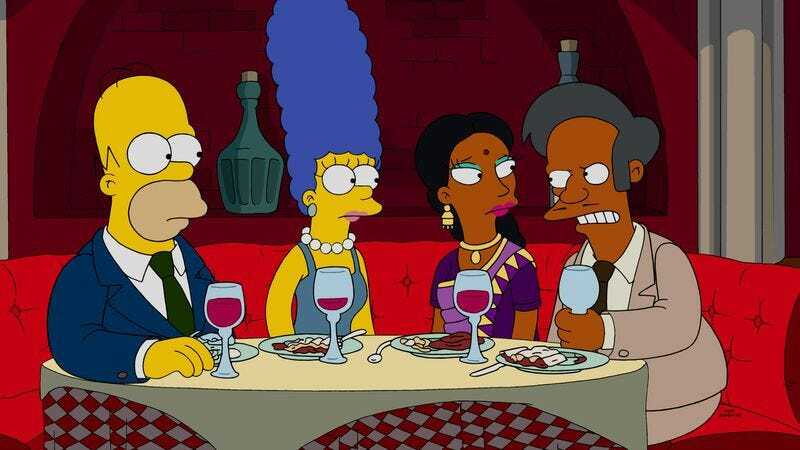 But the episode, especially considering Ambudkar’s involvement, suggests that The Simpsons is at least (and at last) engaged in the conversation. Jay’s eventual defeat at the hands of Bart—who turns off the Quick & Fresh’s electricity for 30 seconds, rightly theorizing the lack of preservatives will destroy everything within—could be seen as the show co-opting one of its critics solely in order to give his point of view some lip service. But Jay’s success outside of Springfield—top of his class at Wharton business school—suggests a kinder interpretation. Unlike his uncle (who graduated top of a class of 7 million back in India), there’s the sense that Jay is going to be able to escape Apu’s stagnant destiny. There’s no question his changes to the Kwik-E-Mart were better for the town, and were successful (Apu concedes that he improved business some 500 per cent), but Springfield isn’t a place for improvement or lasting change. It’s hardly Master Of None’s heartbreakingly effective episode about how second-generation Indian Americans leave behind much of their parents’ identities—for good and bad—but, in parting on good terms, Apu and Jay perform something of the same function. Jay will leave (there’s no indication Ambudkar will be returning), and Apu will stay, because the broader, coarser, but not unkindly comic world of Springfield is the only place that Apu can exist. Like Ambudkar’s brief guest appearance here, all Jay can do is bring in some outside perspective and then leave, and hope his visit shifts the entrenched world of The Simpsons a bit. I realize I’ve made “Much Apu About Something” sound more like a treatise than a sitcom episode, but it’s also very funny, and hangs together exceptionally well (especially for late Simpsons). Caught causing the cops vs. firemen fight that destroys the Kwik-E-Mart, Bart’s promise to Homer never to prank again circles around nicely into the main story, as Homer begs him to un-reform so that the despondent Apu can have his store back. And, while brief, the Lisa-Bart bonding over their shared understanding that, as Lisa puts it, “This family isn’t the best at recognizing achievement” is one of the sweetest interactions the Simpson siblings have had in a long time. He even resists Milhouse’s entreaty to use a brick to smash the window of the cherry-picker Skinner is using to de-tangle the flag, putting it under the front tire instead. “Now he’s even safer than ever!,” gasps the horrified Milhouse. Lisa, appealing to Bart not to destroy Jay’s store, urges him to look into her eyes and tell what he sees. 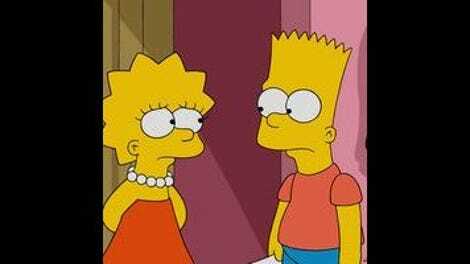 Bart: “I see love. Unconditional love. Which means I can so whatever I want!” That’s a fine joke, sweetness taking a u-turn right back to Bart-logic. Springfield’s corrupting effects on Apu, as revealed in the episode: He lost 30 per cent of his store to Sanjay thanks to a scratch ticket addiction; while he engages in price-gouging during crises, he’s willing to forgive his neighbors for looting.